One of the great things about my new position is I get to learn about a really wide range of artistic disciplines. After focusing largely on classical music for most of a decade, it’s really cool to spend time getting to know more about theatre, dance, visual arts, and pop/punk/folk/roots/world music. Along the way, I’ve started coming up with a list of personal favourites from the various genres. 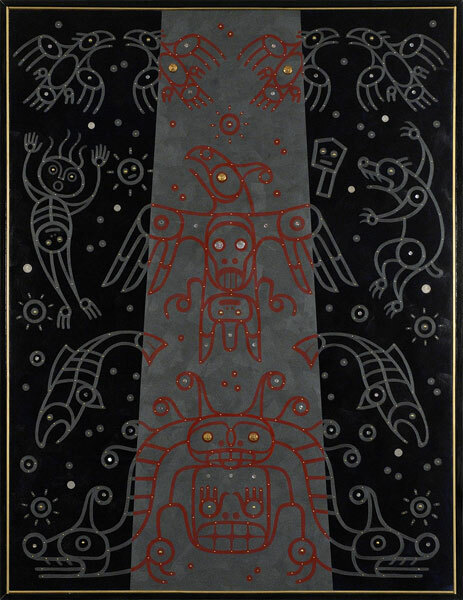 For example, here’s a painting by Marianne Nicolson that was recently featured in an exhibition of works by First Nations artists. I love this painting – it’s such a great mix of traditional and contemporary forms. I wanted to buy it immediately, but someone already beat me to it. I was also about $10,000 short, but I figure it’s O.K. to use credit if you’re buying art. In the next few days I’ll pass along a few more faves, including a spoken word guy, the undisputed king of the ukelele, and a few others.